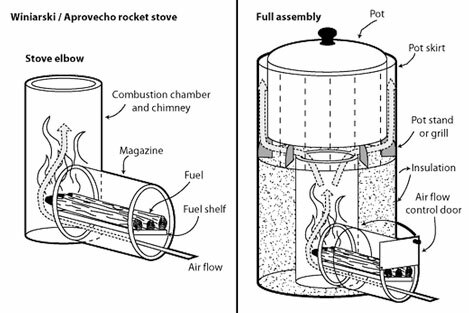 If your interested in an economical but highly effective form of cooking off-grid (or in a grid-down situation), the rocket stove is a perfect choice. Just recently I purchased a rocket stove built by a company called StoveTec. Invented by Dr. Larry Winiarski, the rocket stove is a highly-efficient cooking stove that requires very little wood to cook an entire meal. Due to its design that allows for complete combustion, with just a few twigs and sticks you can maintain a hot burning fire that’s super clean and produces practically no smoke. If you do end up ordering one, I’d love to hear your experience with it. So feel free to leave a comment! I love this, Erich! Very impressive. I will probably buy one because I’ll be teaching a class on Cooking Off Grid, and this oven will be perfect to demo. Yeah, this stove is awesome. That’s funny you say that. I’m actually planning on teaching some off-grid cooking classes here in New England and will be bringing my stove as a demo as well. See, we are on the same waveength Lisa! My husband and I had been planning to build a rocket stove, but have yet to get around to doing it. I ran across your video and we were both impressed. I especially liked how you could leave the charcoal from the sticks in the stove and close up the the vents to leave something to simmer. Very nice review. I purchased one and look forward to trying it out. Thanks for the discount! That’s great! I’d love to hear about your experience with it, it’s an amazing stove. I too have been wanting to build one for a while but due to time constraints I haven’t yet had the chance. I still plan on making one just to compare the two stoves. Thanks for the video! Your demonstration is better than the instructions that came with my stove. Much appreciated. Oh, and thank you for the discount as well! This is great stove that is fun and efficient. Thanks Pamela. I’m glad you like the stove! Thanks for the great review. I just ordered one. Just wanted to let you know though that I used your coupon code and only seem to have gotten a 2.5% discount. I bought the wood/charcoal MK2 for $109.95 and the discount was $2.45. I’m not complaining but just thought you might like to know. Thanks for the great review. I just ordered one. Just wanted to let you know though that I used your coupon code and only seem to have gotten a 2.2% discount. I bought the wood/charcoal MK2 for $109.95 and the discount was $2.45. I’m not complaining but just thought you might like to know. thanks for the update. Unfortunately I don’t have much control over Stovetec’s discounts and they had not sent any update on this change. Although I love their product, my experience with this discount/service they provide has not been the best (this isn’t the first time they’ve changed it). Hey guys check out this company http://www.dragonheaters.com they have Rocket heater cores for sale that are engineered and make the building process alot easier than traditional rocket heaters. They sell DIY plans and have lots of great concepts. These cores are much more effiecient than anything else that I have seen on the market. Better buying a wood stove unless you want to cook outside everyday for “off the grid” shtf. Not everyone has a place that can support a wood stove (apartment, rental etc). And if you have a fireplace, a rocket stove (or two) will fit quite nicely in that nook. While I do have a wood stove for heating, I’d still rather cook with a rocket stove since it’s a lot more efficient. No sense in heating up an entire wood stove (and my house) in the summer just to boil water. Just my 2 cents. This stove rocks. Very efficient. Fun to play with now, and a necessity when TSHTF. As a long time survivalist, I would recommend this stove to conserve heating/cooking material, and to make life that much more less burdensome. I continue to be amazed by these efficient stoves, but my question is do they need to be vented? Or do they have to be used outdoors only? Great review. This looks like an impressive piece of kit.